Odysseo by Cavalia returned to Vancouver for its last run with a premiere event on Tuesday evening which took me to the stars and back. Such an incredible performance by the acrobats, as well as the horses. Under the White Big Top at Olympic Village, spectators of all ages were amazed by the unique blend of equestrian and performing arts, and mesmerized by state-of-the-art special effects. 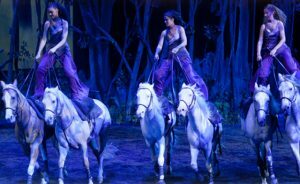 Sharing the magnificent stage with 48 riders, acrobats, aerialists, and musicians, the 65 majestic horses stole the spotlight during this unique theatrical extravaganza, which ended with rapturous applause and a standing ovation. To help immerse the audience in the magical world of Odysseo, images of the most beautiful landscapes from around the world are projected throughout the show onto a 780 square metre screen. And don’t forget the technical grid, worthy of the largest permanent installations in Las Vegas, New York or London, which can support 80 tons of equipment for the stage needs of the show, including the majestic life-sized merry-go-round. Never afraid of using unparalleled technical, visual, and sound infrastructure, the Odysseo creative team has invented a feast for the eyes, a multi-dimensional spectacle with staggering effects created by state-of-the-art scenery. During the breathtaking finale, a vertiginous virtual waterfall overhangs a lake made possible by an underground drain system that releases 150,000 litres of recycled water onto the stage, in which horses, riders, and artists join to frolic, leaving behind them the traces of their splashes—and an astonished audience. Due to overwhelming demand in Vancouver, the producers are extending the show run with the addition of matinee and evening performances through March 5, 2017. Tickets to all performances are now available at www.cavalia.com, at the on-site Box Office, or by calling 1-866-999-8111.